Australia’s leading domestic travel operator APT is expanding its Kimberley Coast Cruising in 2017, announcing the addition of a new ship to its cruise portfolio. The new APT Kimberley Coast Cruising 2017 brochure offers the largest range of cruising to the region. Available in travel agents from today, it features a choice of three cruises styles - luxury, expedition and boutique - across three different vessels. APT is also seeing a surge in popularity amongst those wishing to combine coastal cruising in the region and so is offering a range of cruise and 4WD Kimberley Wilderness Adventures so guests can explore the region from land and sea. The latest addition to APT’s Kimberley cruise portfolio is a luxury cruise experience that showcases the highlights of the Kimberley aboard L’Austral. The ship offers capacity for 230 guests, who enjoy APT’s fully inclusive lifestyle both on and off the ship. Cruises aboard L’Austral operate three departures between Broome and Darwin, and are accompanied by two of APT’s expert Cruise Directors. A 12-strong expedition team sails on this vessel and guests are taken ashore by the ship’s fleet of 12 Zodiacs. 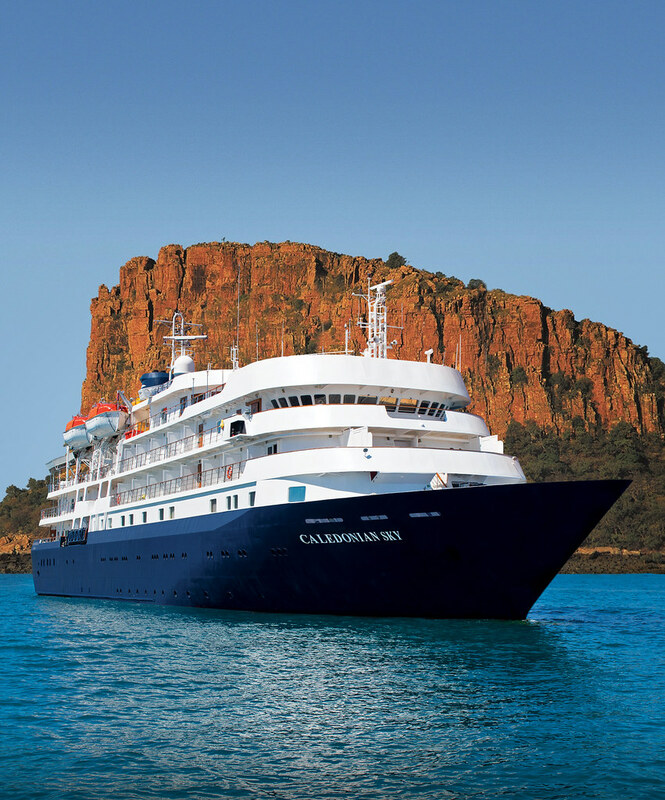 For guests wanting to explore the Kimberley in more depth the brochure features expedition style cruising aboard APT’s own MS Caledonian Sky. The 57-suite vessel enters its third season sailing the Kimberley coast line and APT is offering a choice of five departures on it’s popular 11-day Kimberley Coast Cruise between Darwin and Broome (or Broome to Darwin). APT’s own vessel is a popular choice due to its intimate size, spacious cabins and impressive facilities that include a Lido deck for al fresco dining, a sun deck, library and a lounge, bar and public areas. Guests are accompanied by a 10-strong expedition team and a fleet of 10 Zodiacs enable guests to explore the coastline up close and in-depth. Boutique cruising that allows you to get to the heart of the Kimberley is APT’s third cruise style available in 2017, with a choice of three cruises are being offered aboard the Coral Discoverer. Offering all the comforts of a larger cruiser, it has the more intimate feel of a smaller style ship. Hosting just 72 guests, the ship features an Xplorer vessel for shore excursions, which offers shade for guests and also enables exploration to sites such as King Cascades which are situated further up rivers. APT’s Kimberley Coast Cruise itineraries are fully inclusive and cover all sightseeing, APT’s bespoke Signature Experiences, park and cruise fees, expert services of an APT Expedition Leader/Team, an all day drinks package on the MS Caledonian Sky and L’Austral or drinks with lunch and dinner on board the Coral Discoverer cruise, transfers to and from the ship, expert guest lecturers and all meals. With the new APT brochure launching today, Rob Tandy, General Manager for the company’s Kimberley portfolio says, “Yet again the Kimberley has proven a strong seller for travel agents. APT has a reputation as being an outstanding operator in the region and we’re proud to be the people that guests trust to guide them through Australia’s last frontier. “Kimberley Cruise and land combinations continue to prove attractive and APT has the infrastructure to be able to support travel agents with bookings that offer the opportunity to experience this region from both vistas,” he added. Accommodation on the land tours includes APT’s exclusive network of Wilderness Lodges which offer a touch of luxury in the outback. Also featured are a portfolio of stunning Stations, Hotels and Lodges, such as Home Valley Station and Cicada Lodge, alongside Cable Beach Club Resort & Spa, Emma Gorge Resort in El Questro Wilderness Park, Drysdale River Station, and Hawk Dreaming Wilderness Lodge. Most popular cruise is the 11-day Kimberley Coast Cruise which travels between Darwin and Broome aboard the MS Caledonian Sky. Priced from $11,895 per person it features King George River and Falls, Jar Island, Careening Bay, Bigge Island, Raft Point, Montgomery Reef and Adele Island. APT’s tailor-made sightseeing Signature Experiences include a high powered fast boat ride through Horizontal Falls, admiring the tallest falls in Western Australia at King George Falls and a visit to Raft Point with an Indigenous guide to see Indigenous rock art. To help agents secure early sales, APT is offering a ‘Fly Free’ SuperDeal to the region on all cruise and land tour combinations, representing a saving of up to $2,400 per couple. Cruise-only bookings qualify for a ‘Companion Fly Free’ offer. Availability is limited, terms and conditions apply and the offers are valid until 31 July 2016 or until sold out. APT hosts more people in the Kimberley each year than any other tour and cruise operator and is widely recognised as being one of the region’s leading tourism providers, winning the Best Tour Operator for four years running (2012, 2013, 2014 and 2015) at the NTIAs. 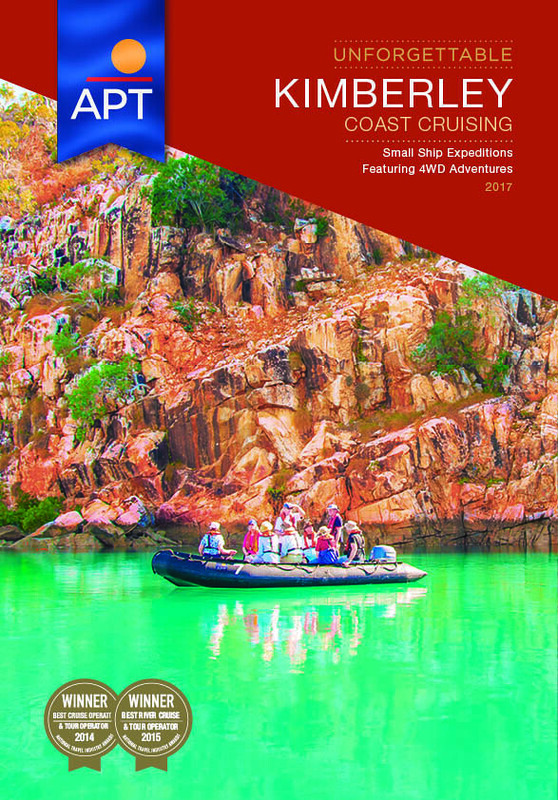 APT’s Kimberley Coast Cruising 2017 brochure is available now. For further information call APT on 1300 196 420, visit www.kimberleywilderness.com.au/cruise or see your local business development manager.